Below are photos and descriptions of our state-of-the-art manufacturing facility. Our attention to detail and use of only top-rated materials is why we can offer a 3 year-non prorated warranty on 1 lb. 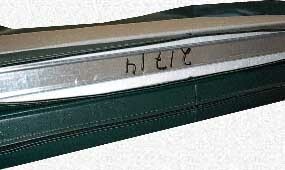 density foam covers (Standard Covers). The hot tub cover skin is made of premium, marine grade vinyl, treated to resist mildew and ultraviolet rays (1500 hrs. rating). 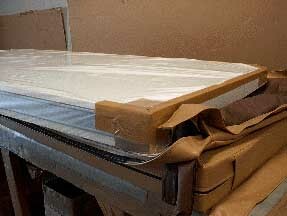 The spa cover liner backing is also mildew and chemical resistant. Layout for our Automatic Cutting Machine to ensure the correct dimensions of your new spa cover. Catalogs over 1000 sizes and shapes. Each spa cover is equipped with several added features to ensure strength and durability. There are two triple-stitched, double-riveted handles for easy removal and storage. Drain grommets are provided to allow water to escape from inside the skin cover. 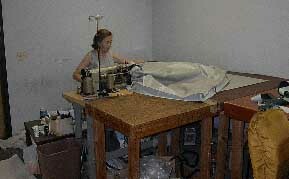 Custom Cover being sewn by one of our experienced sewing operators. For an additional $40.00, we offer a 2# heavy duty cover that is tapered 4″ to 2.5″ and is designed to support over 200 lbs. This is a great feature for areas with heavy snow, large pets or kids. 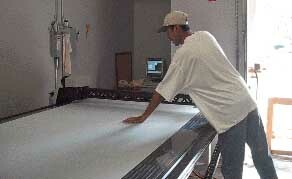 Precise Hand Cutting of a custom shaped spa cover. This shows our unique handle design. 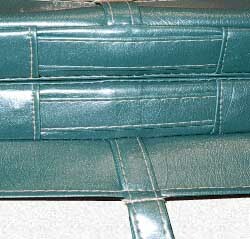 They are Double Riveted and Triple Stitched. NEVER AN INSTANCE OF OUR HANDLES TEARING OUT. Four combination heat seal and vinyl protecting skid pads are incorporated to further protect the cover and minimize heat loss. Heat seal of foam insert to reduce moisture absorption from entering the foam core. This shows the way the foam is RE-INFORCED WITH 20 GAUGE GALVANIZED STEEL C-CHANNEL and a plastic enclosure that keeps moisture out. Detailed look of our C-Channel support and plastic moisture barrier. Do these premium covers meet your spa needs? Then it’s time to select your very own.